The New Jersey Devils' three Stanley Cup winners since 1995 have featured some constants: Goaltender Martin Brodeur, Grand Emperor Lou Lamoriello and the defensive foundation those champions where constructed on. But their coaches have defined each of them. Jacques Lemaire's trapping Devils in 1995. Larry Robinson, the players' coach, whose stunning conference finals tirade sparked the Devils' 3-1 comeback over the Flyers and eventual Cup win in 2000. The late Pat Burns, the coaches' coach, who reined in their offensive stars and oversaw a return to defensive discipline in 2003. Tied 2-2 with the New York Rangers in the Eastern Conference Final, the Devils may still fall short of the Cup in 2012. But should they grab the Chalice, Coach Peter DeBoer has personalized this team in the same manner as his Hall of Fame (and should-damn-well-be-in the Hall of Fame, in Burns's case) predecessors had. He's pushed the right buttons. Preached the right sermons. Earned his players' belief in an offensive system that attempts to re-chisel the cemented stereotypes about Devils hockey. His comportment is one of intellectual serenity — Dan Bylsma style — with a touch of rage. His communication with the players has been honest and non-political. He couldn't have done this three years ago, when ego prevented him from fulfilling his potential as an NHL head coach. That he was the given the chance to do this at all tracks back to July 2011, when Lamoriello stunned the hockey world with an uncharacteristic choice behind the bench. DeBoer's arrival in Florida came after 13 years in the OHL, making DeBoer a coveted commodity for the NHL. In 2008, the Ottawa Senators courted him for their vacancy, as he flew to Barbados to meet with owner Eugene Melnyk. According to ESPN, a clash of egos ensued, and DeBoer immediately took up the Panthers on their standing offer of employment. DeBoer was fired by the Florida Panthers after 103 wins in 246 games, failing to make the playoffs in three seasons. "When I first started, I was cocky, confident we could do it all," DeBoer said last year. In September, he clarified the comment to Fire & Ice: "I don't know about cocky," he said. "The word is very confident and maybe a little naïve. I think I'm still very confident, but this league has a way of humbling you pretty quickly and I think that's one of the lessons you learn." One of the most confident men in hockey, Lamoriello had been humbled as well. When Jacques Lemaire left in 2010, the Devils GM elevated AHL coach and franchise legend John MacLean to his first NHL head coaching job. MacLean was an epic failure: 9-22-2, digging the Devils an early season hole from which even the return of Lemaire couldn't free them. For the second time since 1990, the Devils would miss the playoffs. Lamoriello took "full responsibility" for the debacle. Speculation began that the Devils would go back to a familiar well for Lamoriello: Someone with ties to the Devils, or with their template the Montreal Canadiens; a veteran coach who coach, as Burns did, reestablish the defensive tenets that defined the franchise, much like Lemaire had in his emergency stint has head coach. Someone like Ken Hitchcock, for example. Within that context, DeBoer's announcement was jarring. He wasn't a star name in the coaching ranks. He didn't have the usual connections Lamoriello looks for. He didn't fit the suit. What's going to be interesting is to see how long it takes DeBoer to find his game again. There were reports that constant losing took its toll on the normally mild-mannered coach last season and that his relationship with his players deteriorated. Hey, when you are doing your best to win, but you aren't being provided with the players to be successful, it's easy to see that happening. DeBoer has a wealth of offensive talent at his disposal, but the Devils have always been a defence-first team. 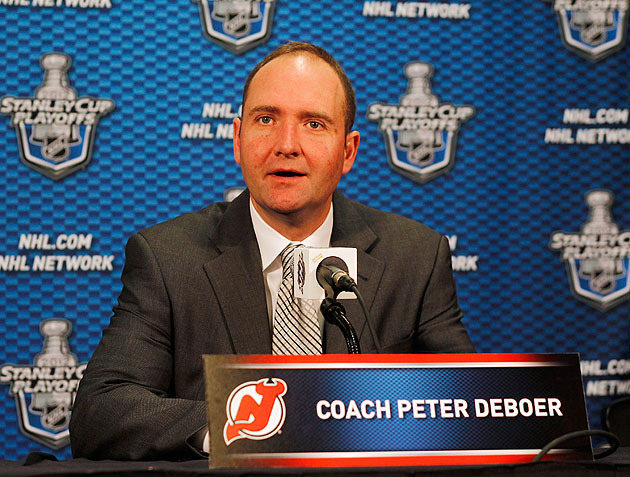 In taking the gig, DeBoer focused more on the former than the latter. After a bare cupboard in Sunrise, he saw a roster that featured Ilya Kovalchuk, Zach Parise, Patik Elias, Travis Zajac, Dainius Zubrus and other offensive forces. When asked last July if it would be "defense first, and the details will take care of themselves," DeBoer bristled at the characterization. "I think it's a little more than that," he said. "The foundation is going to be good, solid defense and being hard to play against. But the rest isn't going to take care of itself. We have to find a way to score more goals and generate more offense. Get our power play better. We have to come up with a plan, and the players have to execute. "We've got a group of forwards here [where] there's no reason we can't increase our offensive production without giving up anything at the other end." It was a leap of faith for Lamoriello. Here was an executive that was stubborn to change with the times since the lockout: Loading up on veterans when winning teams were younger, dialing back offense at a time when new rules were opening up the game. In DeBoer, he had a coach that honored the team's tradition while pushing their system forward. It's the not the first time the Devils have gotten offensive; Larry Robinson, DeBoer's assistant, was there during the Devils' offensive dominance from 1998-2001, when there were a top three goal-scoring team in the NHL. "I think Pete is very intelligent; that's the first thing I recognized about him. He has no ego, and that's a prerequisite here," Lamoriello chuckled. "And I felt very comfortable when I spoke to him. "Philosophically, he believes in defense [another Devils must] and yet he wanted to push a little. The game has changed today and you have to adjust. But the one thing you don't do is change the fundamentals, the particulars, that players have to do. He's done, in my mind, a tremendous job coming from last year to this year." DeBoer's challenge was getting this team to buy what a new coach was selling after the MacLean fiasco. His herald was Devils forward David Clarkson, who played for DeBoer in Kitchener. "He said has that hard work ethic, the structure, the system. He believes if you stick to that system, you're going to be successful," Clarkson told us. "He's been incredible. You ask around this locker room, and the guys love him in the room." And why wouldn't they? DeBoer struck the balance between the team's defensive old testament and his new testament of insistent offense. The Devils' goals-per-game climbed from an NHL worst 2.08 last season to 2.63 under DeBoer, while their goals-against-average was nearly identical (2.52 to 2.50). DeBoer and assistant coaches Adam Oates and Robinson turned the 11th best penalty kill (83.4 percent) and 28th best power play (14.4) in 2010-11 into the 14th best power play (17.2) and the NHL's best kill (an astounding 89.6 percent) during the 2011-12 regular season. He's done some of his best coaching in the playoffs. DeBoer's lineup changes have worked. Like playing prized rookie Adam Larsson in Game 2 against the Flyers, where he scored arguably the biggest goal of the series, and then scratching him in favor of veteran Peter Harrold to great effect against the Rangers. Like scrambling the lines after losses to Henrik Lundqvist and seeing the offense perk up each time. Like deploying a fourth line he created in key situations, and seeing players like Ryan Carter — an old hand from Florida — score big goals. His biggest, boldest move: Pulling Brodeur in Game 3 of the Panthers series with score tied, Brodeur's shortest playoff appearance in 184 games. The Devils would lose the game, but DeBoer may have sparked this resurgence in Brodeur's all-star form: He responded with a Game 4 shutout, and has allowed more than two goals in a game in just 2 of 13 playoff contests since he was yanked — with a .926 save percentage. "I think it's all together but it definitely comes from the coaching staff. You have to give them credit for putting us at ease and not feel embarrassed," Brodeur told the Star-Ledger. "It's not like somebody is talking about you. … That line of communication is tremendous. As long as I've been in the organization, this is as good as I've seen it." Brodeur said the environment is "a little more relaxed" … which, of course, is just another reason the coaching showdown in the Eastern Conference Finals feels like such a contrast — like a mixture of oil and burning hellwater from the base of Mount Tortorella. Tortorella is seething where DeBoer is sardonic. Tortorella looks like the angry police captain who yells at those wacky cops who don't follow protocol, and DeBoer looks like a middle aged tax attorney who occasionally tears into his clients for not collecting all of their travel receipts. Tortorella is American superego with a Cup ring; DeBoer is Canadian ego with a second chance. They toss around accusations of goons-manship -- like the line brawl debates -- and scream at each other over Pierre McGuire's head, but they essentially both believe that physicality and message-sending is the path to glory. That's what makes their rivalry such a kick: They may genuinely dislike each other — a disdain no doubt fueled by DeBoer's refusal to play Tortorella's reindeer games — but neither of them believe that a Ryan Miller brand of hockey pacifism wins in the playoffs. "I love this. Having two coaches who are just as passionate about winning as the player, just adds more intrigue to a series already full of it. And with how good both of these teams are, we're going to be treated to this rivalry within the rivalry for years to come." 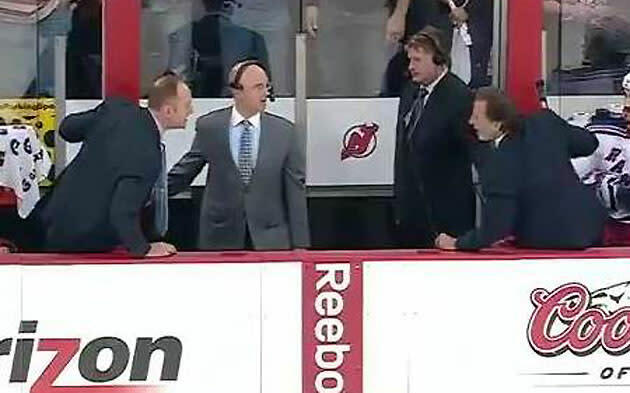 Assuming, of course, DeBoer is still there. He's a New Jersey Devils head coach. As were Doug Carpenter and Jim Schoenfeld and the late John Cunniff and Tom McVie and the late Herb Brooks and Jacques Lemaire (three times) and Robbie Ftorek and Larry Robinson (twice) and Kevin Constantine and the late Pat Burns and Claude Julien and Brent Sutter and John MacLean. And, of course Lou Lamoriello. Twice. 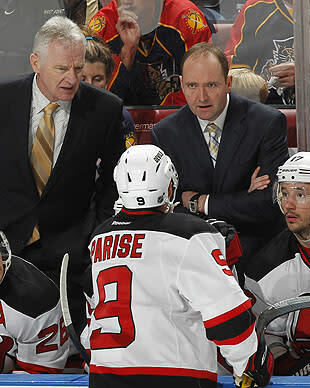 Since Lemaire from 1994-98, the Devils have never had the same head coach for three consecutive seasons. Combined with the fleeting nature of the gig is the fleeting nature of this roster: Zach Parise and Bryce Salvador, keys to the playoff run, are unrestricted free agents. Martin Brodeur is defying his age (40) but not getting any younger. If this is the Devils' moment, it's the perfect storm of the right personnel, mindset and players peaking at the right time — brought together by a coach whose philosophy, decisions and competitive fire have come to define them. These are Peter DeBoer's Devils, inexplicably six wins from the Stanley Cup.